Todd's Mitcham Peppermint (mentha x piperita 'todd's mitcham')also commonly spelled Todd Mitchum Peppermint or called simply "black mitcham". 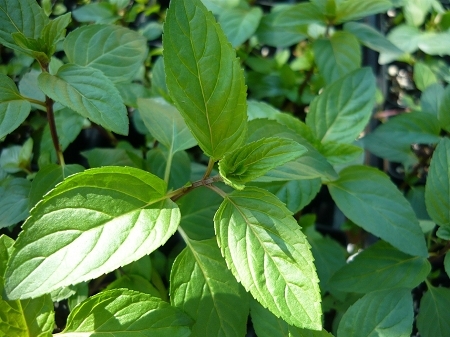 Disease resistant strain developed years ago by the A.M. Todd Peppermint Company for commercial peppermint field production. It contains a high essential oil content and is resistant to verticillium wilt. Excellent variety for tea and culinary use. Easy to grow perennial in zones 4-9 Live plant in 3 inch container. Lots of oil in this peppermint. Taste is spicy and only a few leaves are needed. It's a good variety to have and hard to find. Definitely great for tea and cooking. As with all the plants I received, they were in excellent shape and packed well. I have just made a purchase of over 25 different herbs from this nursery including this Todd's Mitcham Peppermint plant. I buy herbs from many Nursery's Colonial Creek is the best ever. Every herb arrived in perfect shape well established and very healthy and a great size ready to transplant and take off growing. Love these people, plants obviously were grown and cared for with a lot of TLC. I normally would not take the time to comment on every plant purchased but this Nursery deserves it. And the price is a true bargain for the quality. I Highly recommend this grower.